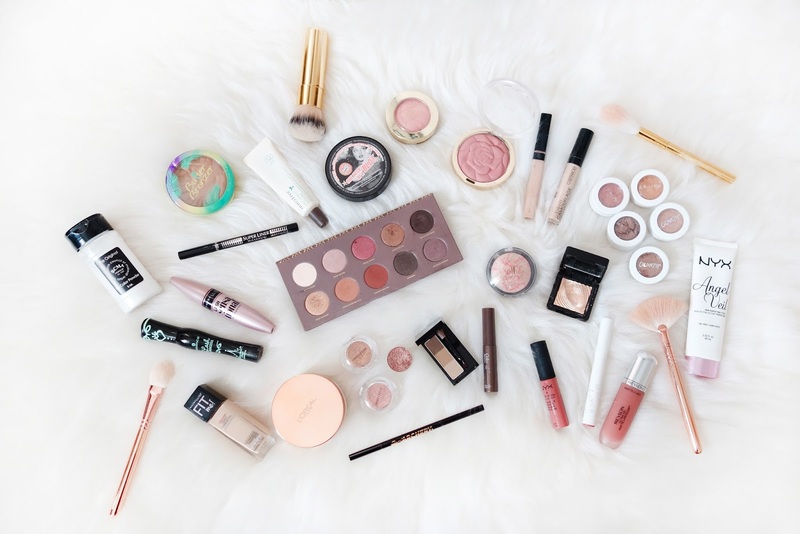 Here I have a round up of my current drugstore and affordable makeup products. I will be updating on my high-end favourites soon so stay tuned for that! Innisfree No Sebum Blur Primer is a really good pore filling primer. I use this on the center of my face where I have enlarged pores and this fills them in nicely without balling up like the Benefit Porefessional. This is one of the few pore filling primers that worked on my skin. 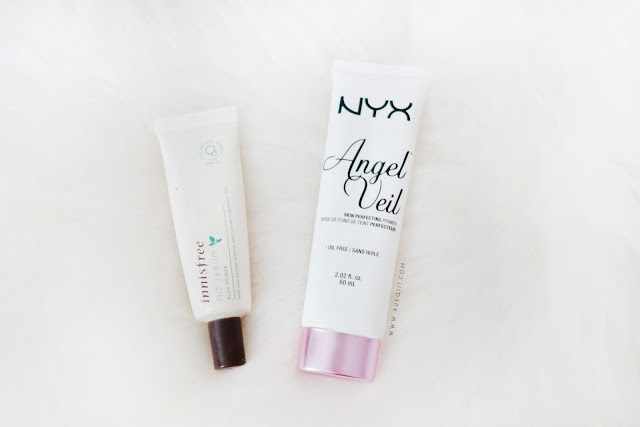 NYX Angel Veil is a very good all round primer to give your skin a silky finish without feeling too silicone-y. If you do not have serious issues of enlarges pores, this will be a good drugstore primer to look into. This is said to be a pretty good dupe for the Hourglass Mineral Veil Primer - NYX is maybe just a tad less long lasting and it doesn't work well with a few of my foundations. I have found that using a good moisturiser is key in a lasting base. Primer is just an additional step if you have extra problem areas to deal with. So if you have decent skin, there is no need to spend extra bucks on primer unless you're looking at a luminous primer like the L'Oreal Lumi Primer. Maybelline Fit Me Dewy + Smooth is a great foundation if you have dry skin. This is very hydrating and dewy so it doesn't cling onto dry patches. If you have oily skin, you should look into the Matte + Poreless version which I own too! But I got it in the wrong shade - 112 is too pink for me. I can mix both foundation together and it gives a pretty nice finish too! L'Oreal Lumi / Lucent Cushion Foundation is one of the best drugstore cushions out there excluding Korean brands (I will be reviewing and comparing all the cushions I own after I'm done testing out all of them!). This gives you a decent medium coverage which is very build-able without looking cakey. I like using this on effortless days when I want a little bit of something to lightly even out my skin tone and then do some spot concealing on problem areas. Maybelline Fit Me is a very easy to blend formula that gives you a medium to full build-able coverage. This doesn't dry out as quickly as the NARS Radiant Creamy Concealer which I felt was a close dupe at first. But after using both over a period of time, I feel that Fit Me has a lighter formula hence lesser coverage then NARS but definitely build-able without feeling cakey! One of my favourites and I already have back ups of this in both 10 Light and 15 Fair. 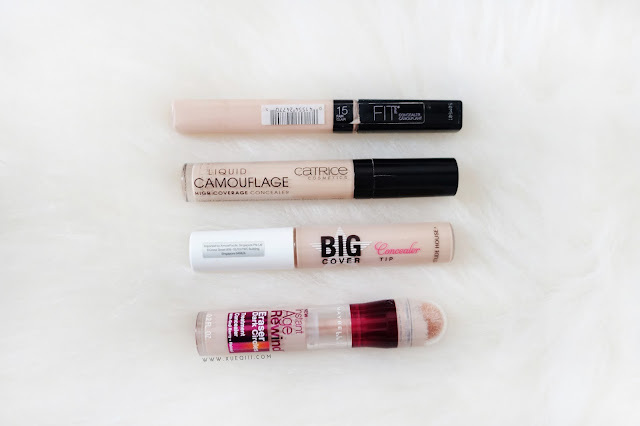 Catrice Liquid Camouflage High Coverage Concealer has been my go-to concealer recently as I have been suffering from horrible breakout and this has FULL coverage. I like to blend this out with a damp sponge or the pad that comes with any cushion foundation. Not cakey, a single layer is sufficient. Definitely will repurchase this one. Etude House Big Cover Tip Concealer is a very hydrating concealer with medium coverage. I also have their Cushion Concealer which I have yet to try - shouldn't be too different of a formula! I like using this when my skin is feeling dry. This is very hydrating and wears well throughout the day despite the hot and humid weather in Singapore. Maybelline Instant Age Rewind Concealer has been my favourite for many years and I will always repurchase this. The only downside is that it dries fast so I work a section at a time. Other than that, this has always been my go-to concealer - I own it in so many shades for concealing and brightening etc. This is the concealer I use when I am not wearing any foundation and just need a little something something to make me look more human again. It looks natural on the skin and wears well. Highly recommend! RCMA No Color Powder is a great powder for pretty much everyone. It isn't too drying for dry skin and also help with setting and shine control for my combination skin. This might not be a great powder if you are extremely oily. You can consider the Maybelline Fit Me Compact Powders which are very good, and they cater to both dry and oily skin types! 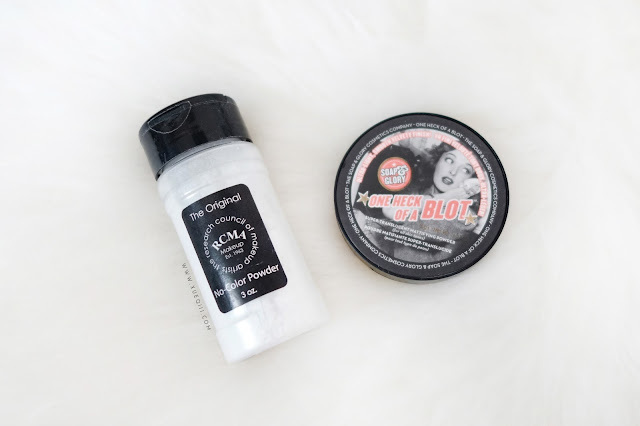 Soap & Glory One Heck of a Blot is my favourite blotting powder throughout the day. It has never left my makeup bag and it mattifies my skin like a dream without disrupting my base. I feel like this even smoothes out my pores and make them look less visible! I do not like using extremely drying powder to set my makeup as I hate feeling very matte and dry. So I do get oily around my t-zone during the day and this has been an amazing touch up powder. 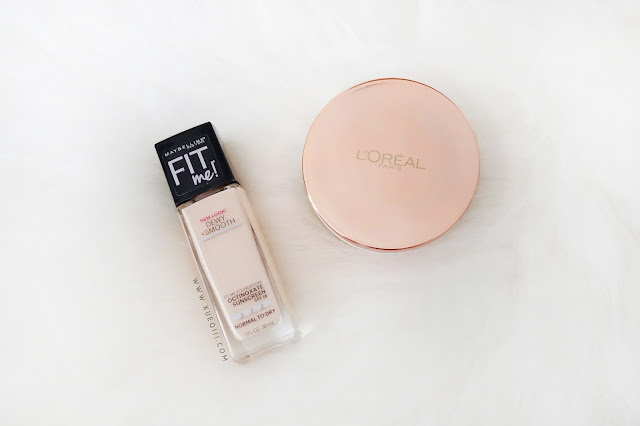 Another old drugstore favourite is the L'Oreal True Match Powder! I also highly recommend the Bourjois Healthy Compact Powder for the great formula and quality. 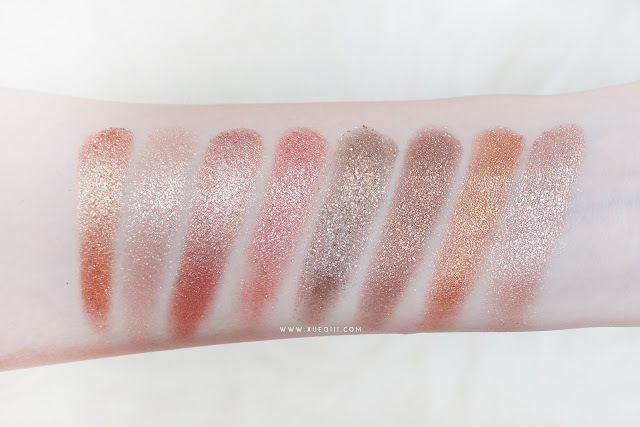 It reminds me so much of the Chanel powder that I own - the only reason this is not featured is because I prefer something with no coverage and even the lightest shade 52 Vanille in this is too dark and orange on my face :( so sad. Physicians Formula Butter Bronzer is an amazing bronzer, be it drugstore or high end, I grab this so much! It is a matte bronzer with a tiny bit of sheen without any shimmers whatsoever! It doesn't look too flat on your skin and looks very skin-like! Some bronzing products can get very powdery and I personally love that this has a sheen to it. It smells like coconut too, like a super strong scent! If you are sensitive to scents, you probably won't like this one. Milani Romantic Rose is a great nudey neutral pink matte blush that pairs well with any makeup look. Mine has a weird store-roomish stale smell to it..... Not a fan of that. But I can overlook it for how beautiful this blush is. Milani Baked Blush Luminoso is definitely a cult favourite and this has been my go-to recently. It has a nice sheen to it and I have been loving non-matte products much more! Probably because of the drier patches on my cheeks. Elf Pinktastic is the BEST highlighter in the drugstore! This quality of highlight can be comparable to high-end brands. So so happy that I found this highlight through Kathleenlights. SUPER PRETTY! 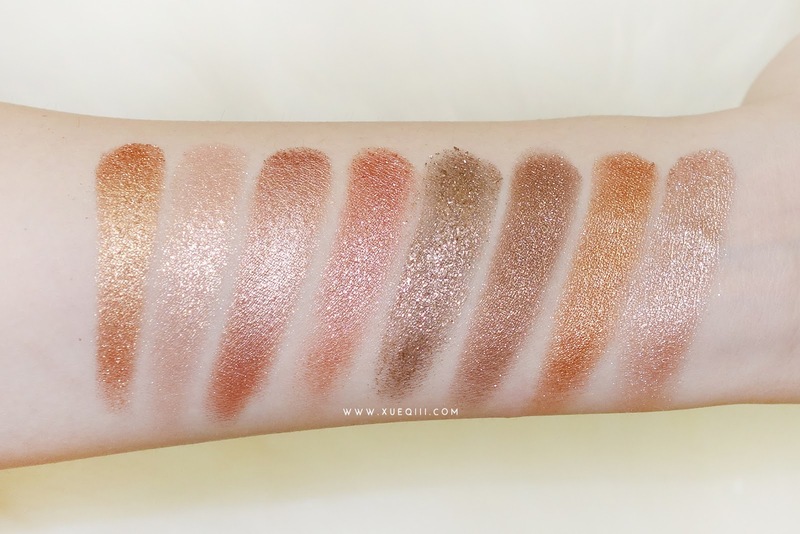 Kiko 208 Water Eyeshadow is pretty much on-par with Pinktastic but it has a golden tone instead of a cool pink. This highlight is SUPER intense and is one of my longest wearing highlight even if I sweat like crazy being outdoors the whole day. I highly recommend both Pinktastic and this but I know Kiko may not be accessible to many people so just go grab Pinktastic! You won't regret it! 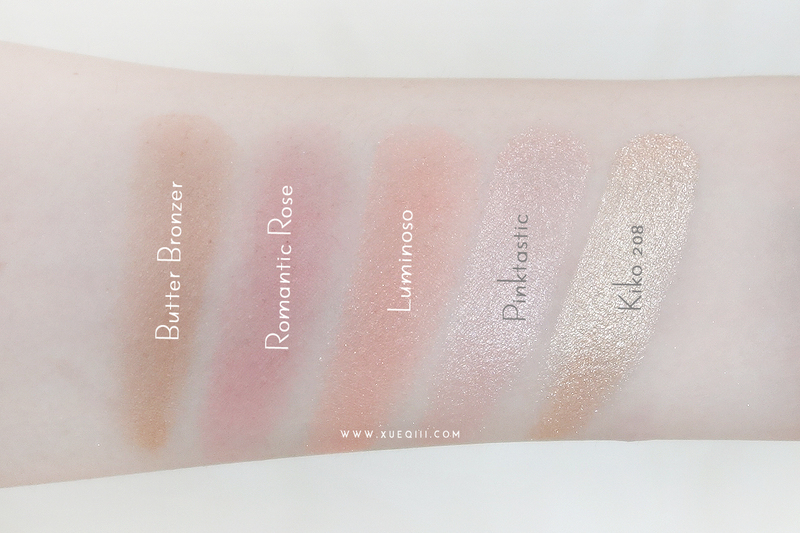 By the way, Kiko 208 is said to be a dupe for Laura Geller's Gilded Honey. If you have medium to slightly deeper skin tone and you want a golden highlight, you can also look at Wet n Wild's Boozy Brunch. It is the exact same shade as the previously limited edition Hollywood Boulevard - very intense and pretty highlight. I didn't include it here is because it is a tad too dark on my skin. p.s. 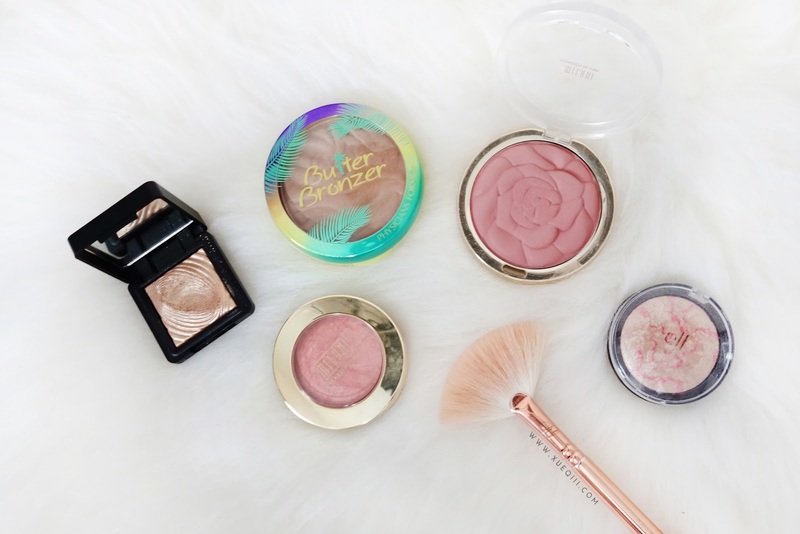 If you love highlighters check out my stash here! Mid range priced highlighters I love are from Ofra - all their highlighting products are pretty bomb. Zoeva Cocoa Blend Palette is one the best affordable palettes out there with great quality shadows. This is the only palette that I have brought with me when I travelled. I have done a detailed post on the palette here with swatches and review. 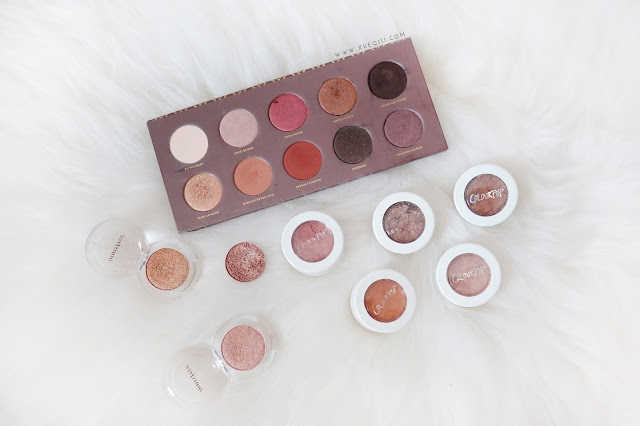 Innisfree Mineral Single Shadows are very comparable to Makeup Geek ones in term of pigmentation and quality! I'm not a huge fan of their matte shadows but I highly recommend the shimmer and glitter ones. I did swatches and review on all the singles that I own here. Makeup Geek Grandstand is such an amazing colour. I highly doubt anyone will not like this shade. Grandstand is a universal flattering shade on ALL skin tones. Their foiled shadows are my favourites of the bunch. 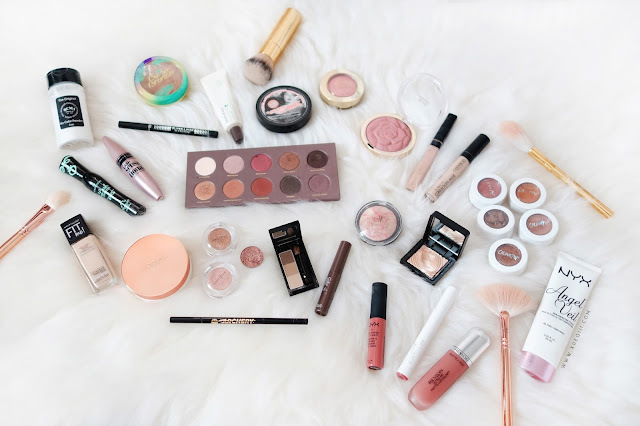 Check out my entire Makeup Geek collection. Colourpop Super Shock Shadows are very pigmented and creamy with a huge shade range. They have mattes, pearlised, metallics in all the colours you can think of. 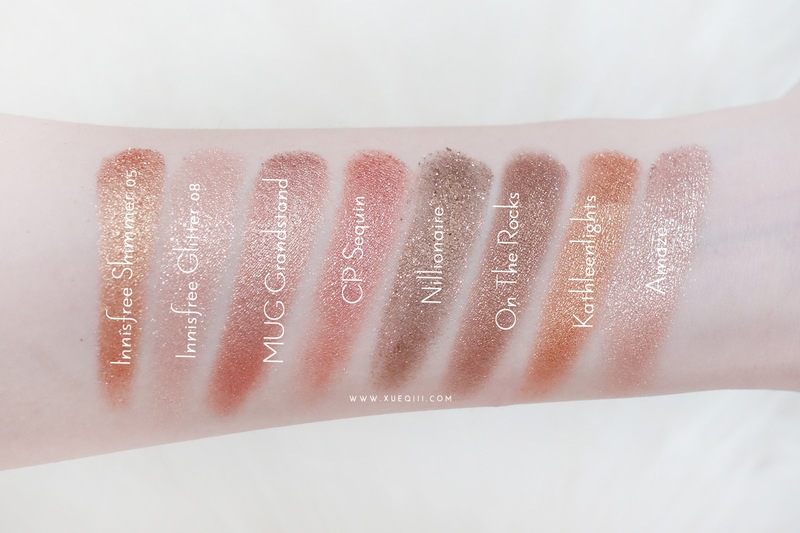 Here I have selected my current top 5 - Sequin, Nillionaire, On The Rocks, Kathleenlights, Amaze. 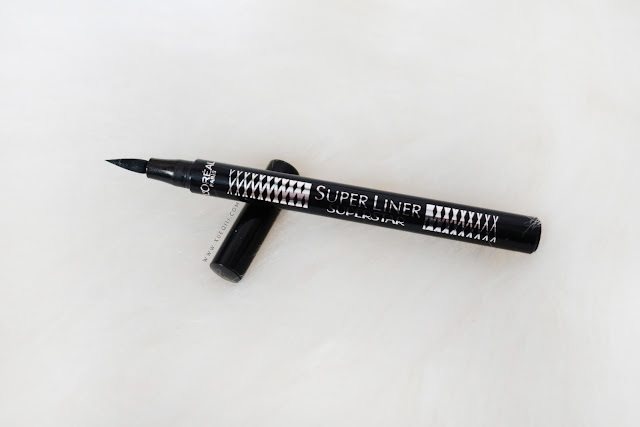 L'Oreal Super Liner Superstar is a felt tip liquid eye liner with a very fine tip. When I first received this I thought this might be hard to work with as it looks really thick and might get messy easily. However, this has surprised me a lot. It is easy to work with and lasts a long time on my lids with no smudging at the end of the day. The only downside I have experienced is that the felt tip isn't as precise as a brush tip when it comes to creating a sharp wing - but nothing a little cotton bud can't fix. A even cheaper liner that does pretty much the same thing as this is the cult favourite Wet n Wild MegaLiner. 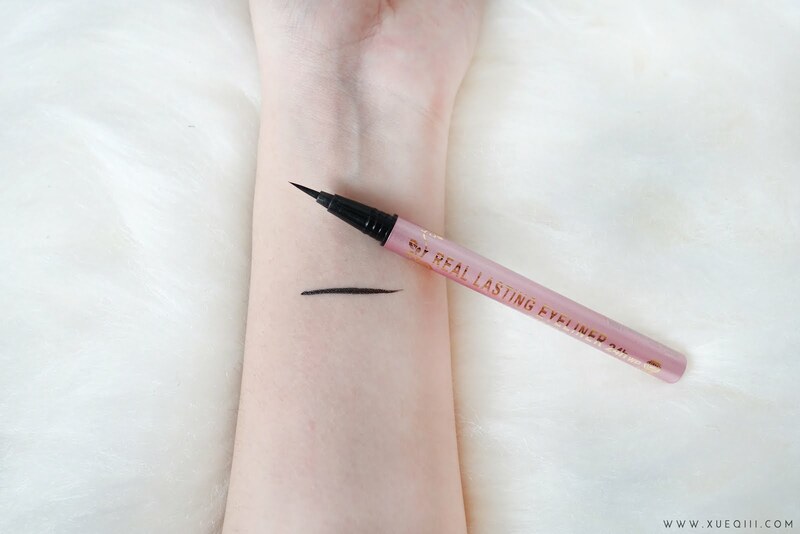 K-Palette 1 Day Tattoo Real Lasting Bulgarian Rose Eyeliner 24H Waterproof. Another of my favourite liner that can be found in Watsons but this isn't very cheap S$20.90 so I will just include this for those who might be interested because this has a brush tip instead. I do love this a lot more than any felt tip liners out there. 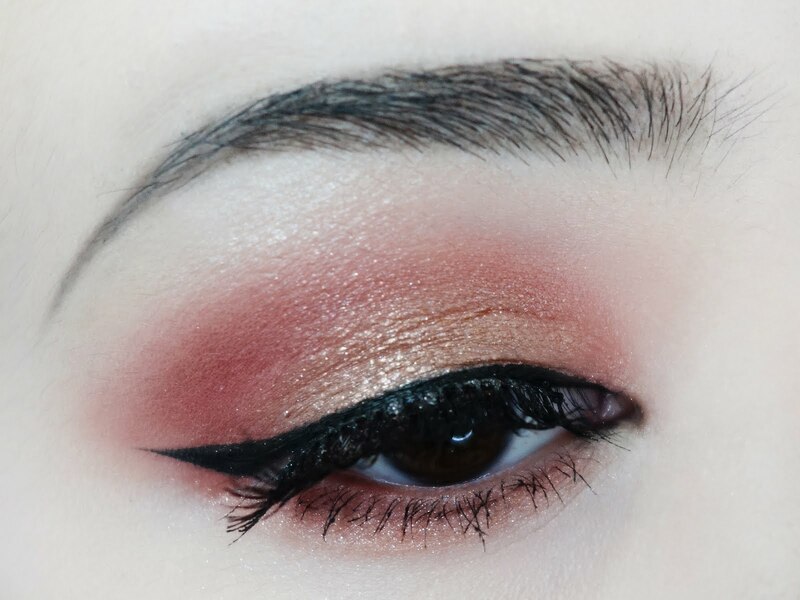 This has got to be my top top favourite liner at the moment be it drugstore or high-end. Essence Lash Princess False Lash Effect Mascara is one of my favourite drugstore mascara formula for overall volume! The only downside is that it smudges if I apply on my lower lashes. Lower lash mascara smudges on me very easily so it's quite hard for me to find one that last the entire day. Even some waterproof formula also smudges a bit at the corners. 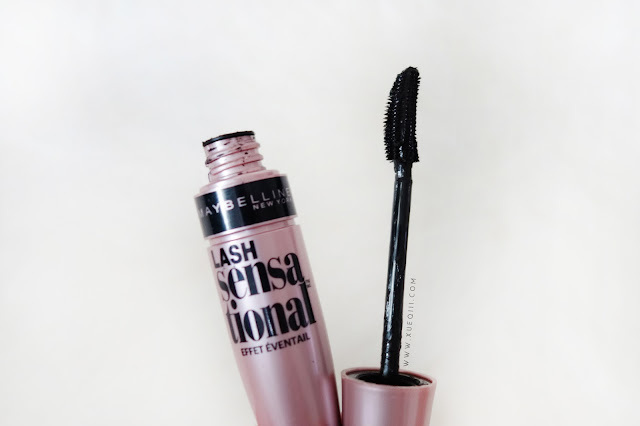 Maybelline Lash Sensational Mascara has quite a similar but fatter wand than the Benefit Roller Lash - which is my current high end favourite. This mascara gives me slightly lesser volume than the Essence one. 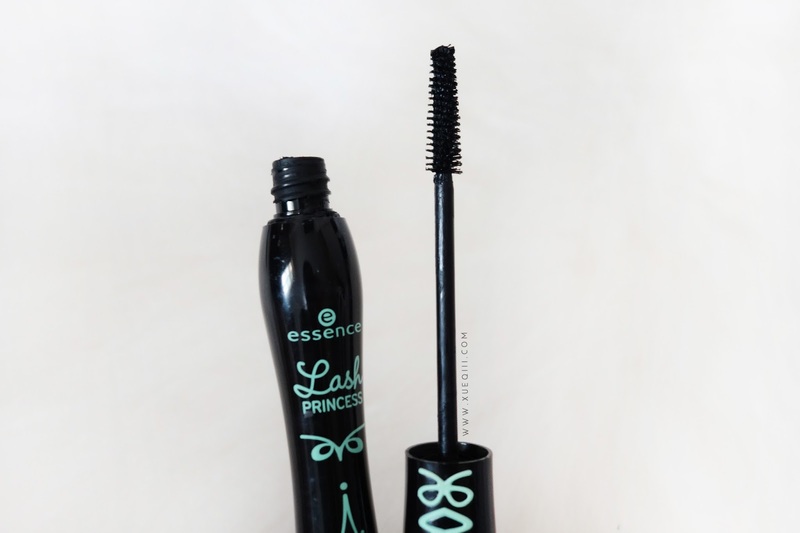 But I like the clean look this gives as it helps with separating your lashes after so many coats and I like to use this right after the Essence mascara. 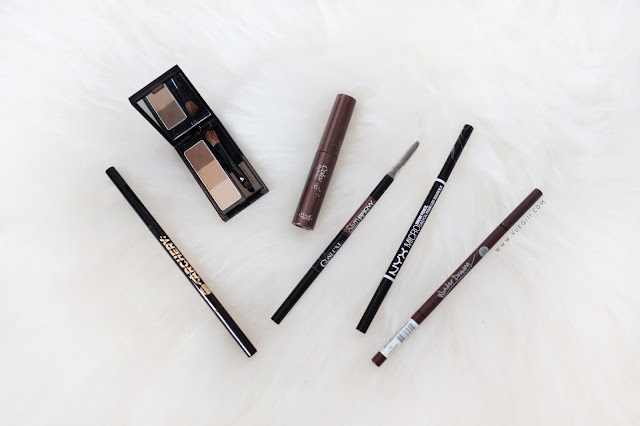 I am not too picky when it comes to brow pencils but after trying quite a number of them I kinda feel the same about these four here - Soap & Glory Archery Brow Pencil Dark Chocolate, Cosluxe Slim Brow Pencil Deep Brown, NYX Micro Brow Ash Brown, Holika Holika Wonder Drawing Skinny Eyebrow Dark Brown. If I had to pick my favourite, I think it has to be the cheapest Cosluxe one. However this brand is only available in Thailand and my second favourite will be Soap & Glory Archery. Kate Designing Brow EX-4 has been my favourite brow powder for many years. It lasts for such a long time! I like mixing the two darker shades to fill in my brows with either the Real Techniques Brow Brush or my other favourite Zoeva 322 Brow Line. I do this when I want to have extra perfect brows for the day. I never ever use any brow gel to set as my brows never had any issues with longevity. Etude House Color My Brow is a fuss free brow filling step that I use on a daily basis. I just start off by brushing my brows using this as it fills in my brow a lot faster than using powder. It looks more natural and not-too-perfect-looking. I use a pencil to finish up the ends and it speeds up my brow process by so much! I have dark hair so I am using the shade #1 Rich Brown. 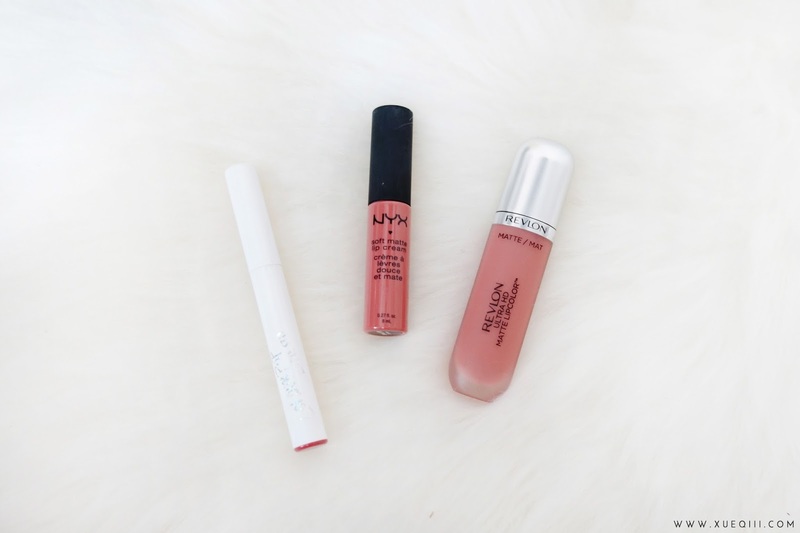 I am quite boring when it comes to lips so these are my top drugstore favourites that I have been using almost everyday. 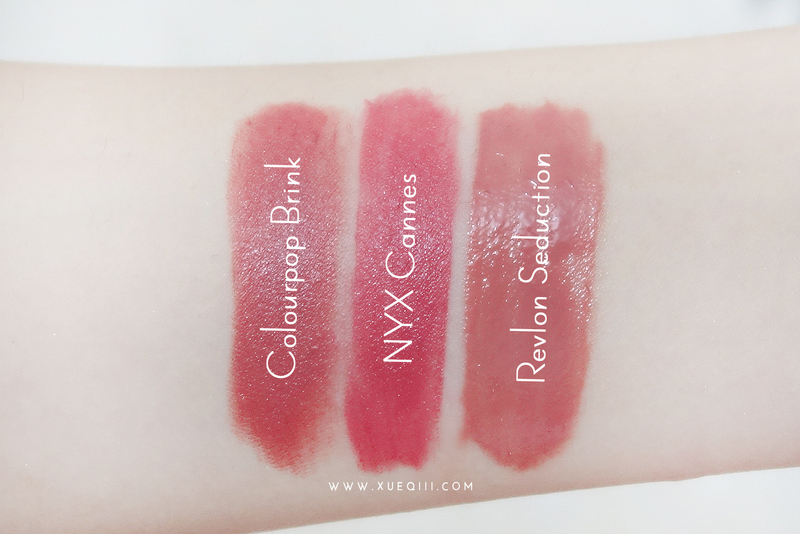 Colourpop Brink Lippie Stix (click for all lippie stix swatches), NYX Cannes Soft Matte Lip Cream (click for SMLC review & swatches), Revlon Seduction (click for all liquid lipsticks review & swatches). That's all for all that I have been loving lately. Stay tuned for my high end makeup obsessions - coming your way soon. Hi, I chanced upon your blog recently and really enjoyed reading your blog. I am always on the hunt for an alternative to my HG Majorlica mascara, i tried the Benefit Roller Lash recently but dont quite cut it to my HG list, it doesnt hold curls well, my lash went back to stick straight after application, i like the lengthening effect though. Having said that how do the two mentioned mascaras fair for curling effect? thanks for the recommendations! I will give them a try if i chance upon them. 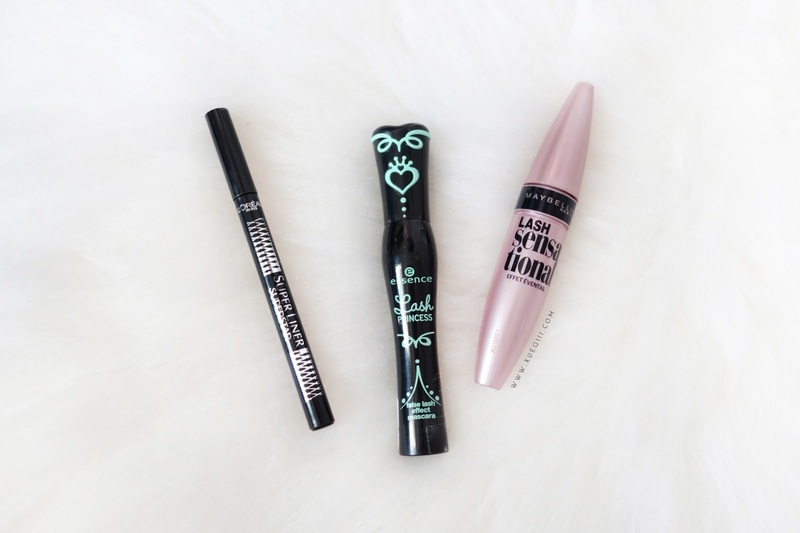 Good thing they are drugstore brands, at least they wont break the bank. I often get my hopes up with all the fancy names or promises that some brands made only to be disappointed most of the time after i tried it. your blog is my new favourite internet find. you take the most glorious pictures and talk about products in such a detailed--but concise--way. i am obsessed!